Zulily is exclusively launching a new brand from Little Giraffe, known for creating the softest, most luxurious blankets for babies and adults. Starting February 4th, Love by Little Giraffe, a quality line of blankets at a lower price point, will premiere exclusively on Zulily. The Love by Little Giraffe on sale at Zulily only 2/4 to 2/6. Three days only so make sure to grab the deals while you can! 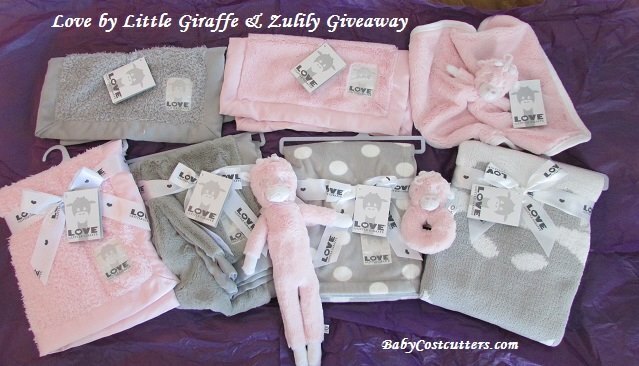 You can read BabyCostcutters full review of the Love by Little Giraffe Prize Pack here. Enter to win an awesome Love by Little Giraffe Prize Pack Bundle in “girl” or “boy” colors. Your choice! Open to US residents only. Ends Feb. 10, 2014 at 11:59pm est. Would be for my baby girl! This would be for my niece about to have a baby!! Would love this for my grandson, thanks! This prize would be for my grandson. my nieces new baby girl she would love it. Would be for my oldest daughter. She is expecting her second child. This would be for my friend who is 7 months pregnant. My beautiful new granddaughter Adelyn. She’s the most adorable baby girl in the world! I would choose a boy one for my nephew! This would be for my baby girl. My husband and I are just a couple of months away from meeting our first baby. It would be for our little one! All the items look absolutely amazing and I’m sure we would get a lot of use and enjoyment from them! For a very special someone who can’t afford to buy this. This would go to our niece/Goddaughter! For my Brother he is having his first Child. I would love to win it for my coworker!